1. The patterns of MRI activity vary significantly in individual patients over time, from one patient to another, and across the different clinical pheno-types of MS. Disease activity tends to decline with patients' age (105) and is very low in patients with PPMS (106,107). 2. The harvest of enhancing MS lesions can be markedly increased when administering a TD of Gd (108). Since those lesions enhancing only after a TD are likely to represent areas with mildly increased BBB permeability (109), the simultaneous presence of lesions enhancing at different Gd doses suggests that the severity of MRI-detectable inflammation is highly variable among lesions from the same MS patients. 3. Patients with SPMS usually have high T1 hypointense lesion load (22,110). In these patients, the volume of "black holes'' correlates better than the T2 lesion load with disability (20,22). 4. Significant reductions of brain volume and cervical cord size can be observed even in the early phase of MS (87,88,111,112). 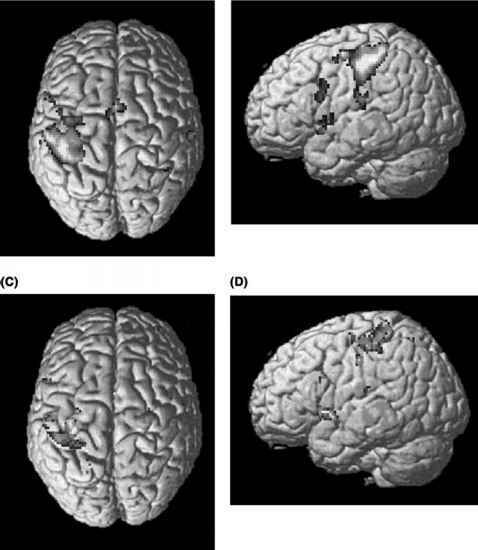 The severity of brain and cord atrophy is, however, more pronounced in the progressive forms of MS (Fig. 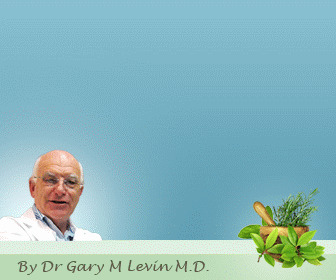 13) (44,47,111,113,114) and can worsen in the absence of MRI-visible disease activity (110,112,115). Cord cross-sectional area and its change over time correlate better with clinical disability than T2-visible burden (113,116). Figure 12 Relative cortical activations on a rendered brain during the performance of a simple motor task with the dominant, functionally unaffected right hand in patients with clinically isolated syndromes suggestive of multiple sclerosis who evolved to definite multiple sclerosis over a short-term follow-up period (A and B) compared with those who did not (C and D). When compared with (C and D), in (A and B), a more extensive and widespread activation of the sensorimotor network is visible. 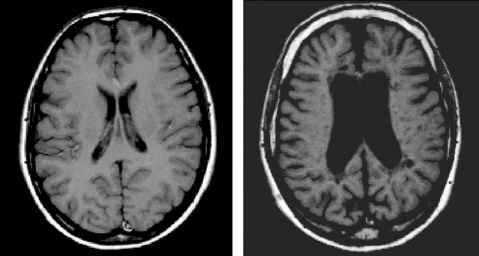 Figure 13 Axial T1-weighted magnetic resonance images of the brain from a normal control patient (A) and from a patient with secondary progressive multiple sclerosis (B). In the multiple sclerosis patient, an enlargement of the lateral ventricles and of the brain sulci is evident. cMRI (89-92). After an initial swelling during the acute phase of ON, the mean area of diseased optic nerves significantly decreases over a one-year follow-up (90,92). Due to the increased pathological specificity to the most destructive aspects of MS pathology and to the ability to quantify subtle tissue damage in the normal-appearing tissue (4), modern quantitative MR techniques are increasing dramatically our understanding of MS pathophysiology, which complements the information derived from the application of cMRI, as outlined in the following paragraphs.